Building on CAHA’s 2018 Forum: Integrating Physical & Behavioral Health Services, CAHA has a new focus on Whole Person Care. Whole person care recognizes that the best way to care for people is to consider their full spectrum of needs – medical, behavioral, socioeconomic and beyond. Attention will be given to issues including integration, a diverse workforce, mental health workforce, aging workforce & population, the health of healthcare workers, substance use, and technology. Facilitate a Learning Community for organizations engaged in or planning integrated care to share ideas, innovations and solutions. Education & Networking: bring people together on specific facets of Whole Person Care, such as multidisciplinary teams, patient/family engagement, workforce and reimbursement. The first Education & Networking event will be held April 24, 8:30 – 10:30 a.m. at the Leona Training Center, 2123 University Park Drive, Suite 150, Okemos, with special guest presenter Christopher G. Wise, MHSA, PhD. To offer whole person care that is centered on the needs of patient and their families, health care teams are examining their practices and implementing improvements. Dr. Wise will discuss why such examination is essential to providing value-based care and describe how practices have undertaken this mission. Issues explored will be practice culture, process redesign, and recognition of the skills and licensure of each team member. Linkages with community agencies and resources are increasingly important to address complex needs, and Dr. Wise will offer examples of how communities and practices are communicating and collaborating with those resources. Click here to register. 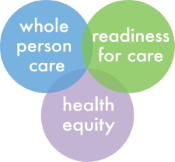 National Approaches to Whole Person Care in the Safety Net: This white paper was developed by the California Health Care Safety Net Institute in 2014. Whole Person Care: Issue Brief and California Whole Person Care Pilot Programs: These publications provide a brief overview of the concepts and methods being explored in the demonstration projects underway as part of the state’s five-year Medicaid waiver, and provide details about the target populations and methods of each of the pilot programs.